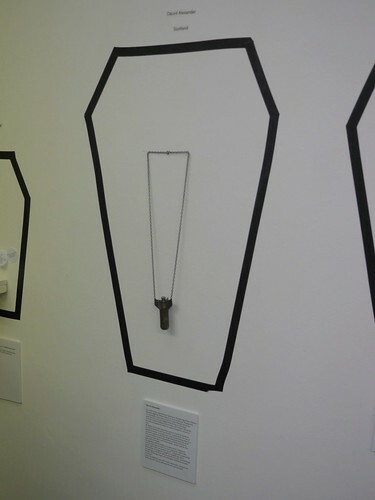 Last night was the opening of Jo Garner's amazing conception for a jewellery exhibition, "Bring Back The Dead" which only runs until Sunday night in the Whitespace Gallery in Edinburgh so if you want to see it, there is a certain urgency about going! It is certainly worth making the effort to see it. This is no ordinary jewellery show, which is why I've rushed this blog post out as soon as I got back home. 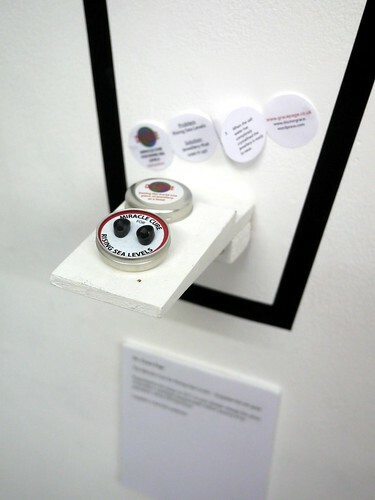 Jo's concept for the show was based around the sad fact that every maker has at least one piece lying about which has never sold, which is sitting forlornly in the back of a drawer or cabinet or is perhaps awaiting recycling. 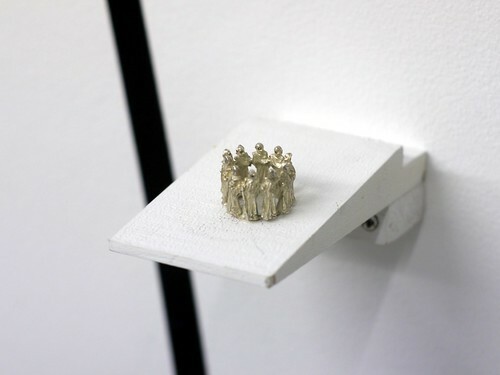 She invited jewellers from around the world to submit one of those pieces on the understanding that at the end of the show, the piece would be brought back to life by being given to one of the other exhibitors to wear or re-purpose themselves. 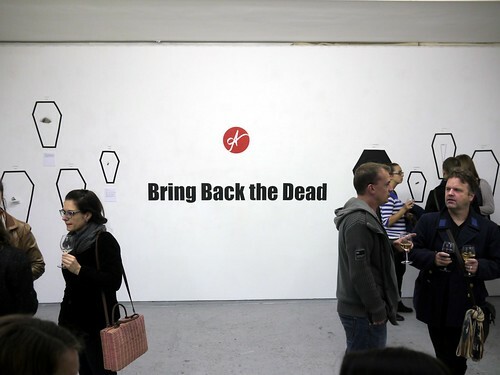 Bring Back the Dead aims to create dialogue between jewellers, whilst promoting the work in a new way and giving older work a new life. How many artists have work in the back of their studios, still in good condition but never sold? What if this work was to be given to another artist, and worn by them? The work would be rejuvenated in the eyes of someone new, and promoted far beyond its confines of the lonely studio corner. The work on show during this exhibition will not be for sale. It will be swapped between jewellers and sent off to live a new life with a new owner. Come along on Friday 20th September 2013 6-9pm to celebrate the opening of the show and view the works. Music will be provided by Wasabi Disco. 34 participants from 7 different countries. Lets break down the barriers. 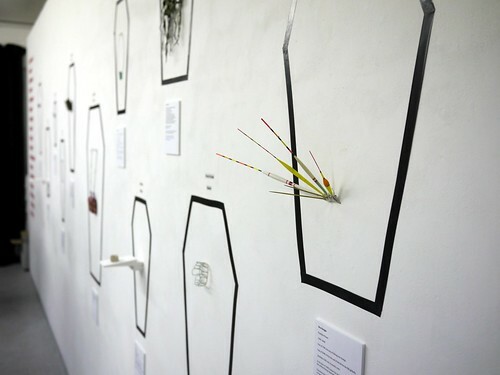 This show features work by Carly Petitt Taylor, Cristina Zani, Dauvit Alexander, Dr Grace Page, Emelie Westerlund, Elin Flognman, Farrah Al - Dujaili, Fiona Hermse, Gill Forsbrook, Hannah Eccles, Hannah May Chapman, Heather Woof, Jaimie Macdonald, Jayne Stephen, Jennifer Nicolson, Jessica Howarth, Joanne Garner, Joanne Haywood, Jo Lavelle, Kathryn Williamson, Kirsty Eaglesfield, Laura Bradshaw – Heap, Laura Munteanu, Lital Mendel, Mark Fenn, Masako Hamaguchi, Mark Mcleish, Molly Ginelly, Nicola Turnbull, Rita Rodner, Ruth Hollywood, Weronika Marek, Wes Designs and ZondermanLidchi. The opening was really well-attended, which is a great sign, especially on the back of an article I had read earlier in the month in The Scotsman newspaper about the National Museum of Scotland promoting the idea of curation amongst young people: it seems to me that what Jo has done is actually a step beyond this. It is with some regret that we announce the passing of Herr Doktor Merkwürdigliebe, better known to most as Doctor Strangelove. It is probably many years since you have thought about the good Doctor as he has slipped from being an everyday television and newspaper personality into relative obscurity, but take a moment to reflect on what Strangelove meant to you. He began to lose his mysterious powers from the moment the Berlin Wall fell and was further weakened by the rise of global terrorism in recent years until finally fading away to a symbolic cypher in the face of governments who can instil fear and terror in their populations without recourse to anything more than a prismatic beam-splitter and an iron-grip over the media. Strangelove will be fondly remembered for making us realise what side we were on; for making the other side seem “bad” while we seemed “good”. Despite his capactity for destruction, Strangelove sought to simplify our lives – something at which he did not wholly succeed – but by being divisive, by being a high-risk strategist, ultimately became irrelevant. Carry Strangelove over your heart. Remember always how much you are held in contempt by your government. 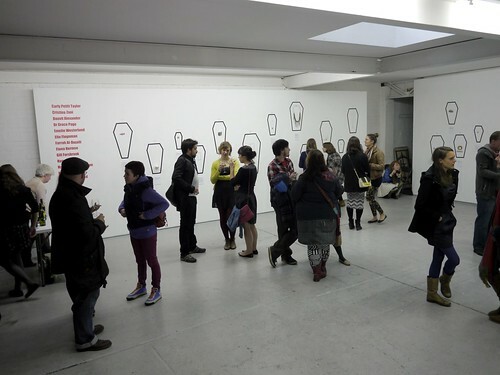 The show is bursting with brilliant work: there is not a poor piece in the gallery and the obituaries are mostly very funny or at least informative. It is hard to imagine how the works in this show remained unsold! I can't wait to see who's piece I get. Further post when I finally know. Thanks to Jo and her Anomaly team for putting together such a great show, dynamic, humorous and thoughtful. Thanks, Vanessa! I hope to see it happen again sometime. Dr. Strangelove... well, I am hoping that I know who it goes to. 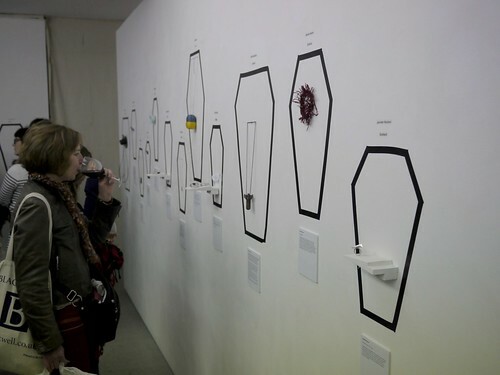 I love this idea and the pieces featured. I'm envious of the person who will get your Dr. Strangelove piece. Thanks for sharing information about this show. It was an inspired idea for a show, beautifully executed. Great idea! Thank you for posting about this show.